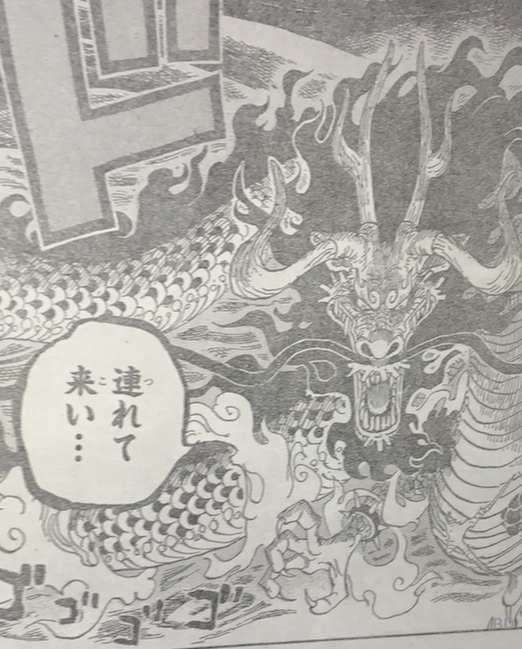 جزء من غلاف الفصل ويظهر " كايدو " و " زورو "
- Kaido is a big dragon (he's Dragon Zoan user or something like that). A Kunoichi named Shinobu appears in this chapter. Kinemon: There are 3 powerful helpers, Kamatsu(not sure how to pronounce it, means river pine), Denjirou and Ashura Douji. We need to find them asap. 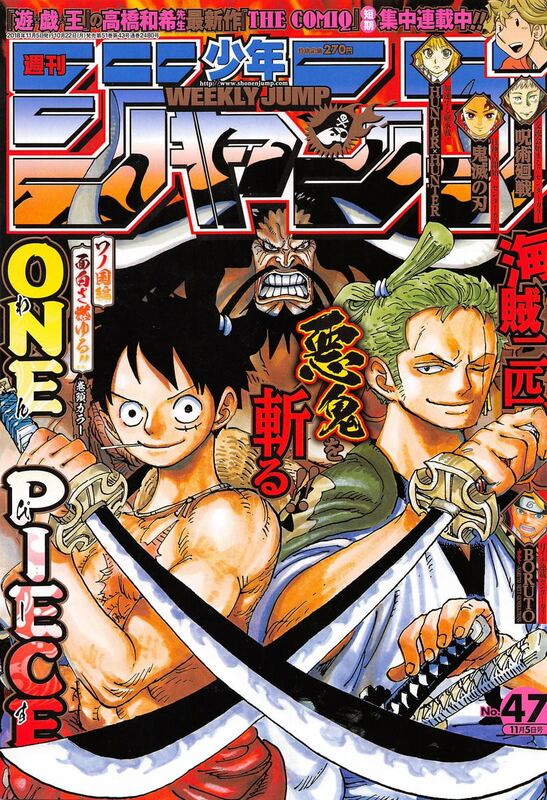 Shuten Maru and his Atamayama Thieves arrive at Okobore Town and encounter Jack. Jack: I believe Luffy came here. Shuten Maru: I don't know what are you talking about. They are nearly even-matched, but Jack has a little bit of upper hand. يظهر Kunoichi المسمى Shinobu في هذا الفصل. الكينيمون: هناك 3 مساعدين أقوياء ، كاماتسو (غير متأكد من كيفية نطقها ، يعني نهر الصنوبر) ، دينجيرو و Ashura Douji. نحن بحاجة للعثور عليهم في اسرع وقت ممكن. يصل شوتن مارو وصوصه أتاماياما إلى مدينة اوكوبور ويواجهون جاك. جاك: أعتقد أن لوفي جاء إلى هنا. شوتن مارو: لا أعرف ما الذي تتحدث عنه. هم متساوون تقريبا ، لكن جاك لديه القليل من اليد العليا. The fire represents the festival, the two-winged island represents the Chinese Zodiac Bird and the moon represents their rebellion. He also draws a port. Law tells Luffy to look at the sky. A dragon's form is shown among the clouds telling Jack to bring those kids to him.